Did you know that 1 out of every 8 people living in this country are 65 or older? Did you know that 1 out of every 6 seniors is living in poverty? Did you know that within the next 20 years, these numbers will double? Now, more than ever in the history of time, senior citizens need help. Co-pays and deductibles on prescriptions are going up. Medicare no longer covers prescription eye glasses, hearing aids or dentures and all of these things are needed for senior citizens to keep their dignity, health and well-being. Do you know someone who may need help? If you do, please submit a bequest on their behalf. 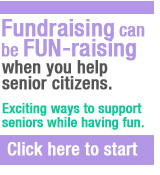 You may also help to raise awareness to those who you know on behalf of that senior citizen. Click here for easy instructions on how to get help to provide immediate and permanent relief for those who need it most -- a senior citizen who has a need for help. Sponsor Seniors depends heavily on stories and bequests that are submitted by those who know of elderly people living in poverty that are currently taking medication and have out-of-pocket expenses for them. If you know someone who is in need, please submit their stories here and we’ll publish them in our website to request for support. Copyright 2011 © Sponsor Seniors, Inc.